Frank Start, VE3AJ (SK) had authored several interesting articles that are included in the Lakehead Amateur Radio Club historic files. While trying to put together a profile of Frank, the man behind the articles, we have been unable to find a great deal of word of mouth details of his life and past history with Lakehead Amateur Radio Club. By searching the online archives on our site, mention of Frank Start does appear in several issues. These have not been fully assessed at this time. I did not know Frank very well, the person who was his friend was VE3AJ Bill Klemacki, he took over Frank’s call of VE3AJ after Frank died, and unfortunately Bill passed away as well. All I really knew about Frank was that he was a ship’s radio officer at one time. He had an old time spark gap transmitter and receiver which was reputed to be the one that took the message about the fugitive Dr. Crippen and his girl friend, how true I don’t know but it looked old enough. We used to run field day on rear portion of his property on Government Road, which was a very good receiving site. I met Frank only once in Ottawa. It was in the 1980’s, I was not ham then but I wanted a UHF/VHF receiver and was somehow directed to Frank. I bought a new Icom R-7000 from him. He had some sort of arrangement with a communications retailer. It was only years later that I became aware of his association with the Lakehead and ham radio. Beyond that, I cannot provide any more details. was the Chief Wireless Operator for Captain J.E.Bernier, aboard the CGS Arctic; what a trip that was! through his extensive ‘ham’ connections. What an extended AND terrific ‘family’! 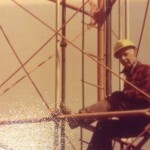 Thank you for your posting about your father, Bill Choat, in the Lakehead Amateur Radio site back in October 5, 2015. It was exciting to read your post as I am writing a play about Capt. J.E. Bernier and his final voyages aboard the CGS Arctic.You father is mentioned, very tenderly, in the research I have come across and I wondered if it would be possible to interview you about what you may remember your Dad mentioning about his time with Capt. Bernier?